There have been so many stories related to the discovery of a woman in an iron coffin this week. Here is a link to one of those stories. Many have been fascinated by the fact that she was in nearly perfect condition; “She looked like she had been dead for a week, but it was 160 years” stated one of the articles. The iron coffin was first developed before the Civil War. The “air-tight coffin of cast or raised metal” was patented on November 14, 1848 by Almon (also shown as Almond) D. Fisk of New York. The patent that was granted would be different than what would be produced in the coming years. I have only seen one picture of the original patent version. This was probably a prototype and appeared to be at the scene of a disinterment. The first coffin was built in 1849 at the Fisk & Raymond Co. Foundry in Winfield, Long Island. 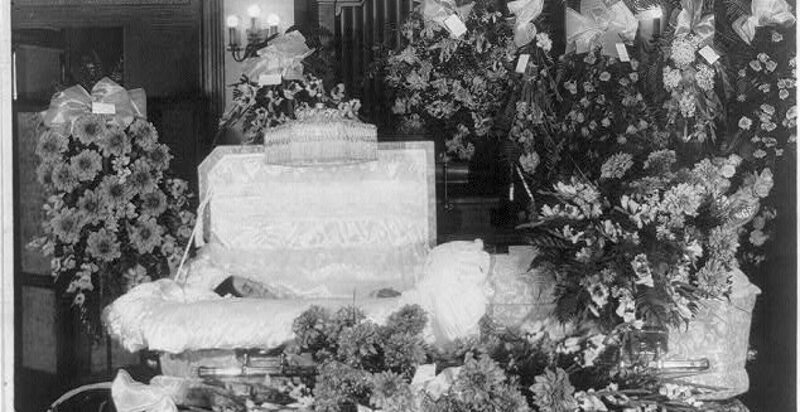 Through several years of challenges, Fisk was finally able to go in to full production by 1850, with coffins of every size from infant to adult. Ranging in price from $7.00 to $40.00 depending on the size and finish. There were 3 designs; Mummieform Model 1, Mummieform Model 2 and Model 3 that was an imitiation Rosewood finish and less like the other two models. The first 2 coffins were two pieces with a groove were a sealing compound was placed to make them air-tight. They were then screwed together with bolts. They had a window for viewing and a place for a name plate. They were made to fit the form of the body hence the name “mummieform”. 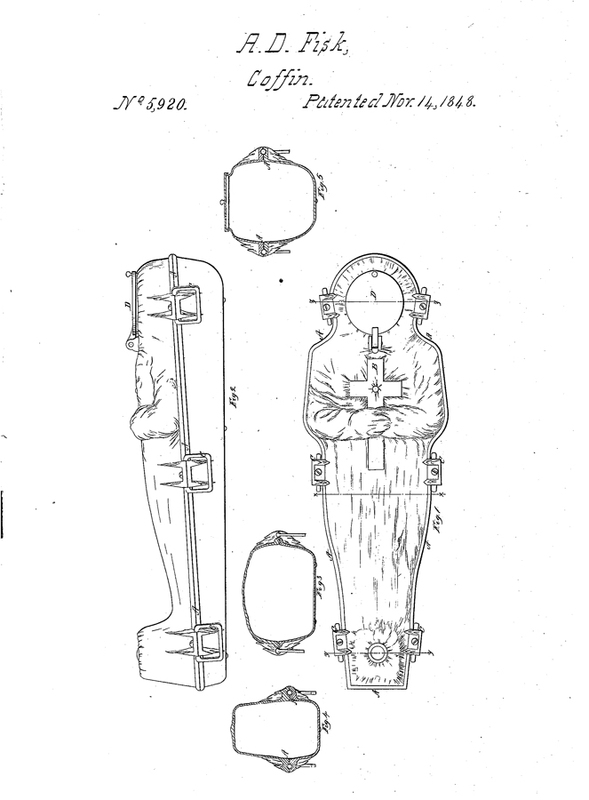 The patent for the coffin expired in 1862 but was not renewed because of illness and subsequent death for Mr. Fisk. The lapsed patent allowed others to produce similar products for a short period of time. However, Fisk’s wife was able to petition Congress to grant a seven year extension to protect his work. From the 1870’s onward until about the mid-1880’s there are publications showing designs created and sold by others. From the mid-1880’s forward though there are no further publications related to this type of coffin. But what was the most astounding thing about the Fisk Coffin would be when they were discovered after being buried. Most frequently they were found when there was a disinterment or when a cemetery was moved. In situations where the outer surface of the coffin was not breached, the remains inside were in near perfect condition, including preservation of the body and clothing. Where breaches did occur it depended upon how long the coffin remained open and exposed to the elements, that determined the condition of the remains. By all accounts of the days when these coffins were in use, they were considered a luxury item because of their cost. Something possibly on the order of the casket that we saw Michael Jackson and Aretha Franklin laid to rest in, of that time period. With the most recent discovery in New York City we once again are shown the durability of this invention. I have no doubt that these will continue to be found in future years.